Whether in the executive office or the waiting room, the Bedford Gooseneck Guest Chair will definitely make an impression. With gooseneck arms, nailhead trim and Queen Anne style legs, it will infuse your workspace with traditional elegance. These chairs don’t just look great, they also keep your company happy. The more comfortable people are as they sit in reception chairs, the better mood they will be in when it’s time for meetings or appointments. 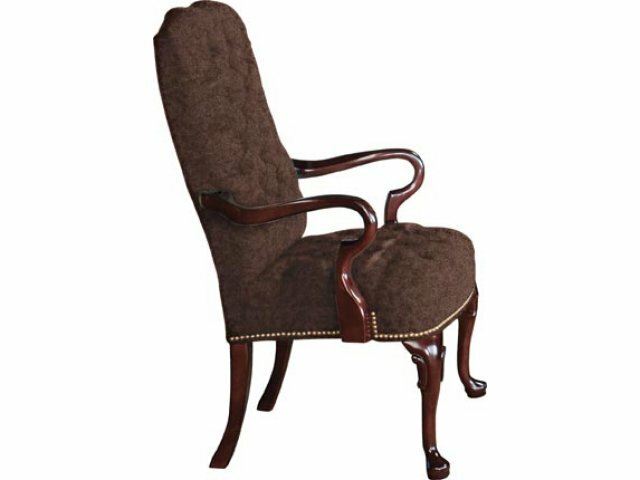 Bedford guest chairs have deep tufted seats and a high back which provide cushy support for your clients while they wait. With such cozy, stylish seating to enjoy in your reception area, no one will mind sitting for a few minutes before going into the office. Enhanced Support: A high back facilitates proper positioning for a comfortable wait. Stately Detailing: Deep tufted seats and backs, and nailhead trim provide those little touches that will set your space apart. Traditional Appeal: Gooseneck arms and Queen Anne style legs have an old-world charm that gives your space a unique look. Safety First: Fire-retardant foam minimizes damage in the case of an accident.